These digital multimeters perform the functions you would expect to see in a multifunction DMM, including measuring volts, ohms, and amps. Basic V dc accuracy of up to 0.0024 %, 10 A current range, and a wide ohms range give you an unbeatable combination of measurement capability. You can also use the 8845A and 8846A to measure frequency and period. In addition, the 8846A measures temperature and capacitance. The functions of a counter, capacitance meter, and thermometer are built in for unparalleled versatility. Extend the meters’ utility even more with their graphical display modes, including TrendplotTM paperless recorder mode, statistics and histograms—features you won’t find on other multimeters. 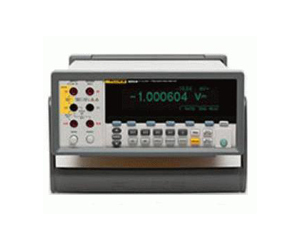 The Fluke 8845A and 8846A include a TrendPlot™ function that is essentially a technique for reducing a time-series of measurements into a form that is easy to store and analyze, while still maintaining detail. Thanks to on-board signal processing power and a high-performance analog-to-digital converter and graphical display, the Fluke 884X is the first precision 6.5 digit multimeter to offer TrendPlot capability. Of course, these meters are also durable and dependable, features you expect from any Fluke meter. This unique combination of features and performance makes the 8845A and 8846A an unbeatable value for a wide variety of applications, including manufacturing test, research and development, and service.